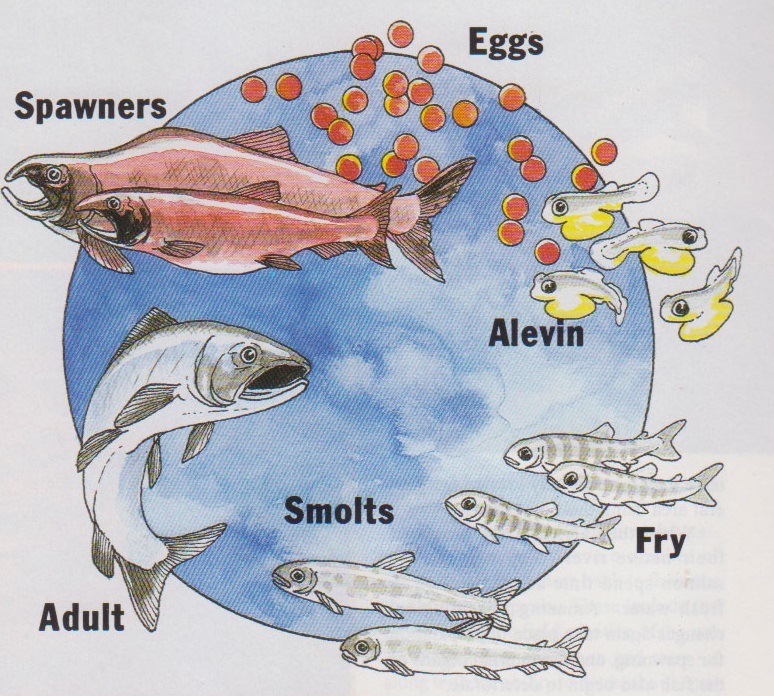 Pacific salmon life-cycle: The female returns to her spawning area and releases her eggs into a scooped-out depression. In spring the eggs produce alevins, which have yolk sacs below their bellies which contain all the nutrients they need for proper growth. Then the fry emerge and migrate to saltwater, where in the following spring they migrate to the sea for 2 1/2 years. As adults, the salmon complete their life-cycle when they return home to spawn. Click for larger view. The life cycle and habits of salmon have been studied in detail because of the fish’s usefulness as a food resource — not only for the people of this region, but also as a major export. Salmon begin their remarkable life-cycle from eggs which have been laid, fertilized, and covered with gravel (sometimes sand) in the upper reaches of a river or stream. Water must flow through the gravel to supply oxygen. After incubation, tiny alevins (pronounced AL-i-vinz) emerge from the eggs. Alevins have a yolk sac below their bellies which contains sufficient nutrition for their early development. They do not emerge from under the gravel during this alevin stage, but stay there for protection against predators until their yolk sac is fully absorbed. When they emerge they are 3-4 centimetres (about 1 1/2 inches) long, and are called fry. They make their way to larger freshwater pools for protection from sunlight and predators. The time which fry stay in fresh water varies with the species, and can be from two to 20 months. Partly incubated salmon eggs in a hatchery. Just before they journey downstream to the ocean, some physiological changes occur, and the young salmon are now called smolts. Here an amazing adaptation takes place: the creatures start to adapt from their freshwater homes to the salt water of the ocean. This process will be reversed again when the fish later return to the place of their birth to spawn. After a period of adjustment to salt water at the river’s mouth, they make their way to the sea, where they spend most of their adult lives. Time spent in the ocean also varies with species, but is normally one to five years. While in the ocean, salmon travel thousands of miles from their native rivers. The mystery of migration is still only vaguely understood, and is another of the many evidence of intricate design found in created things. There is evidence to support the conclusion that salmon have a number of senses which lead them back to their native stream to spawn. These include the earth’s magnetic field, position of the sun — and possibly the moon and stars — along with the ability to detect the chemical composition of the stream from which they began. Each stream and river has minor differences in chemical composition, and there is good evidence to conclude that salmon taste the difference to identify their native stream. This method, of course, would only be useful once they have already located the general area using their other senses. When they arrive at the mouth of their native river to spawn, Pacific salmon spend time adjusting back to fresh water. Amazing physiological changes again take place in preparation for spawning, and the internal organs of the fish also begin to deteriorate. The spawning salmon also provide bears with a food source. The exact time salmon begin their extraordinary return upstream to their spawning grounds varies, but actual spawning takes place in autumn. They make their way upstream, usually when autumn rains come and raise the stream levels. They jump obstacles, negotiate rapids, and sometimes stop to rest in larger pools where water is moving more slowly. They eventually reach the gravel beds at the top of the stream where they began their lives. After surviving the gruelling journey back to the place they were born, the fish select a mate and begin the spawning process in a riffle (shallow water almost filled with gravel where water is forced to flow through). The female vigorously sweeps her tail in the gravel and digs a hollow called a redd. Then both male and female face upstream. The female lays a batch of eggs and simultaneously the male at her side releases a cloud of milt to fertilize them. The female then covers the eggs with gravel, and they repeat the process several times. Thousands of eggs are laid. Shortly after completing spawning both male and female die. The salmon’s remarkable achievements and life-style, particularly in its amazing ability to navigate great distances with perfect accuracy against incredible odds, are impossible to explain satisfactorily as a result of purposeless, unguided evolution. Instead, the Pacific salmon can be seen to be a wonderful testimony which clearly points us to the Creator.